For the past few months, I’ve had the great opportunity of working with the International Youth Leadership Foundation (IYLF) on their social media. IYLF is a Cleveland non-profit whose mission is to posture highly motivated students from diverse cultural and socioeconomic backgrounds to be thought leaders and innovators in their future careers of choice. IYLF plans to accomplish this through domestic and international programs that focus on career enrichment, cultural awareness, and globally conscious leadership. Their mission alone made me interested in working with them to accomplish this mission. I was really excited when I got offered a marketing internship. The internship has been great so far! 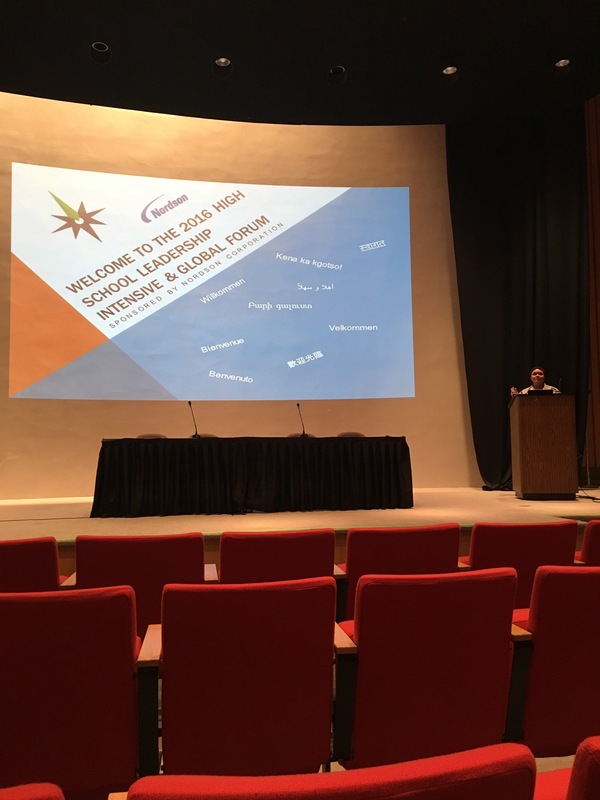 Last Saturday, we had our big event – The 2016 Fall Leadership Intensive and Global Forum. Much of my social media work has been geared toward this event. The conference was at the Cleveland Bar Association in downtown Cleveland. When I walked in, I was greeted by some of the dedicated members of the IYLF board who signed me in. I was then directed to the auditorium and offered breakfast. There was some delicious options such as fruit and baked goods. I noticed there was something missing from the breakfast station which was brought up later in the day. We started the conference with some ice breakers where we got a chance to learn more about each other. It was a fun way to start off the day. The next part of the day including some really great self-reflecting activities. I learned about my leadership styles, my personality, stress relief, emotional awareness, and so much more. The sessions were really an open discussion about who we are and who we want to be. I felt an open space to talk about myself as a person. I noticed once again as we passed empty cups on the table that something was missing, but that’s neither here nor there. After some group discussion and problem-solving activities, we had lunch. We were served turkey sandwiches on croissants along with chips. The meal was really delicious but once again I craved something that simply wasn’t there. Then I realized that I was very thirsty. We were all offered water but the water was brown and did not look drinkable. The next part of the conference tied everything together. Melinda, the founder of the organization, explained that the global issue we were focusing on was the water crisis. There was no drinkable water available anywhere during the conference to symbolize what many people around the world face everyday – no access to clean drinking water. Once the mystery issue was revealed we heard from some guest panelists about their work to help the water crisis around the world. The panelists talked about their work in Uganda, Haiti, and even Swaziland from a panelist that called in from Africa! I learned a lot about how crucial water is and for many people it does not simply come out of a faucet. For many poorer countries, children have to walk miles before school to get water for their families. They may have to stand in line for hours just to pour gallons of water into a bin. The distance to get to the water is not the only hardship. The water they collect may not always be clean. Actually, the water often makes them severely sick. The forum really enlightened me on such a crucial issue that affects millions of people. It also really makes me appreciative for something I know I often take for granted. I think that everyone in the room had their eyes open to this situation that is mostly ignored. After the forum, I got a chance to talk with some of the board members of IYLF. I love that I got a chance to get to know them better and vice versa. There are really a lot of hardworking people in the organization who really care about what they do. Overall, the event was wonderful. I learned a lot of valuable information about myself and the rest of the world. I’m already excited about next year’s conference! Please take some time to look into the International Youth Leadership Foundation. They are doing some great work for today’s youth. I’m very lucky to be able to work with them and participate in what they are doing. You can visit their website IYLFleads.org to learn more about them!